The return to earth of the US astronaut took about 45 minutes. Barry Wilmore had spent close to six months aboard an international Space Station. Together with Alexander Samokutyaev and Elena Serova, they completed a 249-mile free-fall. “The landing of the three crew members at the remote town of Dzhezkazgan in Kazakhstan was successful, timely and on target.” All of them appeared to be in their best conditions having landed in a vertical position. This is according to a post by the center screen of the Russian Federal Space Agency’s Mission Control Center in Korolev. 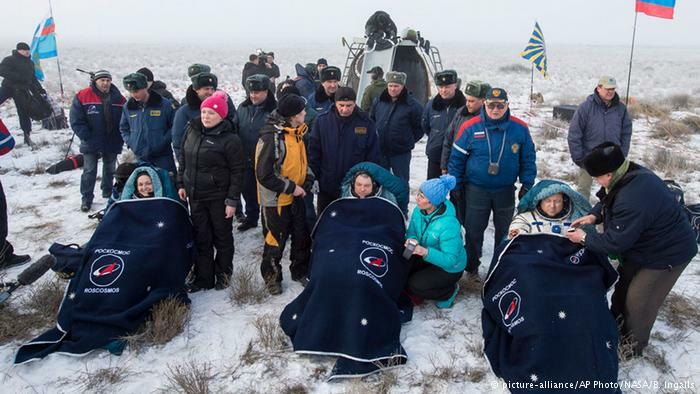 They were received by Russian search and recovery forces that are usually on point to receive returning spacefarers. Samokutyaev who was the first astronaut to be removed from the capsule and who was the Soyuz commander had spent 331 days in the space. Wilmore was next to be pulled out. He was able to complete 4 spacewalks and is now counting 178 days of being in space. He is currently the outgoing International Space Station Commander. Smiling broadly while being bundled on her chair against temperatures that were below freezing, Serova was removed last having spent 167 days. While at the station, the trio carried out several researches. Their areas of interest included the effects of microgravity on cells, observation of the earth among others. However, the main focus was on human health management for long-duration space travel. This comes at a time when NASA and Roscosmos are preparing three crew members for the next launch aboard the space station. Currently expedition 43 is in operation at the station with two members on boards as they await for three other members;Scott Kelly, Russian cosmonauts Mikhail Kornienko and Gennady Padalka. Instead of the usual stay of six months, Scott Kelly and Mikhail Kornienko are expected to spend an entire year at the research outpost. This will enhance their collection of valuable biomedical data that would be used to analyze a future deep space and long duration missions.